Shaker Cabinet Doors (5-piece), TFL recessed panel | ACS, Inc.
textured TFL (Thermally Fused Laminate) which provides the look and feel of real wood with superior durability. solid color TFL which adds a modern flare to this traditional style. Using some of the most advanced products on the market, each door’s elements are edge banded 4 edges and color-matched to emulate a solid wood door. The stiles and rails of our five piece doors are joined by 3 wooden dowels glued in place at each joint providing superior strength. Because our shaker doors are constructed with individual stiles and rails, the wood grain orientation on the TFL mimics that of a solid wood door. 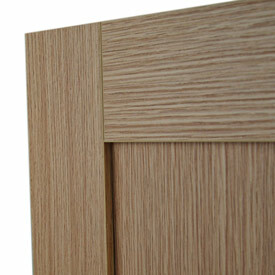 These fronts are superior to a thermofoil door both in form and function. ACS offers hinge boring options for Blum hardware and allows the customer to decide where on the door the hinges should be located. 5-piece shaker doors are available from 10" x 10" to 32" x 60".